VIDEO: Fun building on women’s history, past hard work and accomplishments! from Marguerite Kearns on Vimeo. Happy holidays from the people at Suffrage Wagon News Channel! on Vimeo. A Wish for Santa: Support Permanent Exhibit of “Spirit of 1776” Wagon! on Vimeo. We’re thrilled to devote the December 8, 2015 program at Suffrage Wagon Cafe to videos that highlight the upcoming holiday season. Wish upon a star for the 2016 Inez Milholland centennial. Celebrate the 72 years that American women campaigned vigorously for the right to vote. Suffrage Wagon Cafe opened its doors in March 2015 and has been offering special programs since then. 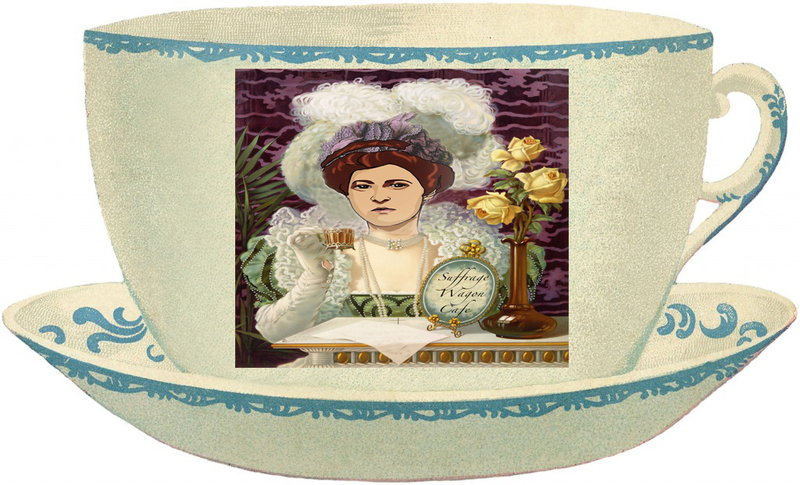 Catch up on past Suffrage Wagon Cafe programs. Honor the extraordinary work and sacrifice that went into the largest nonviolent grassroots social revolution in the history of the United States. Make sure you see two important films: “Suffragette” (about the English suffrage movement) and “10 Days in a Madhouse” (about Nellie Bly, trailblazing investigative reporter who covered the suffrage movement). Ask Santa for his support of the permanent exhibit of the “Spirit of 1776” suffrage campaign wagon used by suffrage activist Edna Kearns in the Votes for Women activism. The wagon is in the collection of the New York State Museum. And we’re thrilled that it will be on exhibit in 2017, the state’s suffrage centennial observance. Let’s visualize the wagon on exhibit in 2020 and beyond. Thank the State of New York for its creation of a state suffrage centennial commission for 2017, as well as the financial support of the events and activities. Happy holidays! And follow Season I of the “Spirit of 1776” suffrage storytelling on Suffrage Wagon News Channel. In 2016, the Suffrage Wagon Cooking School will feature recipes and a cooking contest. The cooking school celebrated its first birthday in 2015. And visit the Suffrage Wagon’s archival library. Stay tuned! Episode #10: Bess cautions Edna about getting married on suffrage storytelling!